The xlwings add-in is the preferred way to be able to use RunPython or UDFs. Note that you don’t need an add-in if you just want to manipulate Excel from Python via xlwings. The ribbon of the add-in is compatible with Excel >= 2007 on Windows and >= 2016 on Mac. You could, however, use the add-in with earlier versions but you would need to change the settings directly in the config file, see below. On Mac, all UDF related functionality is not available. The add-in is password protected with the password xlwings. For debugging or to add new extensions, you need to unprotect it. To install the add-in, it’s easiest to use the command line client: xlwings addin install. Technically, this copies the add-in from Python’s installation directory to Excel’s XLSTART folder. If you encounter issues, then you can also download the add-in (xlwings.xlam) from the GitHub Release page (make sure you download the same version as the version of the Python package). Once downloaded, you can install the add-in by going to Developer > Excel Add-in > Browse. If you don’t see Developer as tab in your ribbon, make sure to activate the tab first under File > Options > Customize Ribbon (Mac: Cmd + , > Ribbon & Toolbar). Then, to use RunPython or UDFs in a workbook, you need to set a reference to xlwings in the VBA editor, see screenshot (Windows: Tools > References..., Mac: it’s on the lower left corner of the VBA editor). Note that when you create a workbook via xlwings quickstart, the reference is already set. Interpreter: This is the path to the Python interpreter (works also with virtual or conda envs), e.g. "C:\Python35\pythonw.exe" or "/usr/local/bin/python3.5". An empty field defaults to pythonw that expects the interpreter to be set in the PATH on Windows or .bash_profile on Mac. PYTHONPATH: If the source file of your code is not found, add the path here. 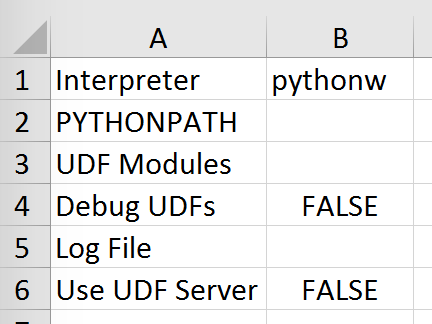 UDF_MODULES: Names of Python modules (without .py extension) from which the UDFs are being imported. Separate multiple modules by “;”. Example: UDF_MODULES = "common_udfs;myproject" The default imports a file in the same directory as the Excel spreadsheet with the same name but ending in .py. Debug UDFs: Check this box if you want to run the xlwings COM server manually for debugging, see Debugging. Log File: Leave empty for default location (see below) or provide the full path, e.g. .
RunPython: Use UDF Server: Uses the same COM Server for RunPython as for UDFs. This will be faster, as the interpreter doesn’t shut down after each call. Restart UDF Server: This shuts down the UDF Server/Python interpreter. It’ll be restarted upon the next function call. Mac Excel 2011 users have to create and edit the config file manually under ~/.xlwings/xlwings.conf as the ribbon is not supported. The global settings of the Ribbon/Config file can be overridden for one or more workbooks by creating a xlwings.conf file in the workbook’s directory. Workbook specific settings will override global (Ribbon) and workbook directory config files: Workbook specific settings are set by listing the config key/value pairs in a sheet with the name xlwings.conf. When you create a new project with xlwings quickstart, it’ll already have such a sheet but you need to rename it to xlwings.conf to make it active. Sometimes it might be useful to run xlwings code without having to install an add-in first. To do so, you need to use the standalone option when creating a new project: xlwings quickstart myproject --standalone. 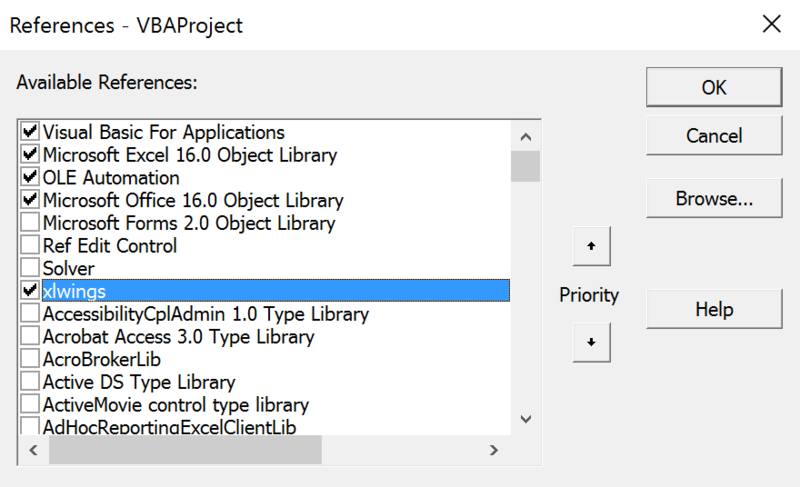 This will add the content of the add-in as a single VBA module so you don’t need to set a reference to the add-in anymore. It will still read in the settings from your xlwings.conf if you don’t override them by using a sheet with the name xlwings.conf.